They say that information is power and I’m not sure it would be prudent to disagree. The more you know the less likely it is for anyone to take advantage of what you don’t know. That’s one of the reasons professionals in the repair community work so hard to ensure you understand not only what needs to be done when they are making a service recommendation, but why it’s important to do it… and, why doing it now makes sense: not only for them, but for you as well. The benefit of “doing it now” when you’re talking about any ‘for pay’ service on your vehicle is fairly obvious from the service facility’s point of view. The critical issue is and will always be, does it make any sense to you. Because the benefit is so obvious to the service provider the question of motivation is almost certain to raise its ugly head. Is the guy behind the service counter trying to ‘sell’ me some superfluous or unnecessary service to round out a ‘good’ week or is this something I really should consider doing? Before I answer that question I’d like to reinforce whatever it is you know about automotive service or maintenance with a bit of information – remember, information is power! I hope you will find useful. It is the difference between Suggested and Required and how these two fundamental principles are almost certain to impact you. The first element of automotive service or maintenance to consider whenever it’s time for you to bring your vehicle in is Required. It’s also the easiest to explain. If the service recommendation can be found in the Owner’s Manual and its performance is necessary in order to keep the vehicle in warranty – it’s Required. Sure, you can argue that some of the services are superfluous: but, realistically your argument isn’t likely to hold up. 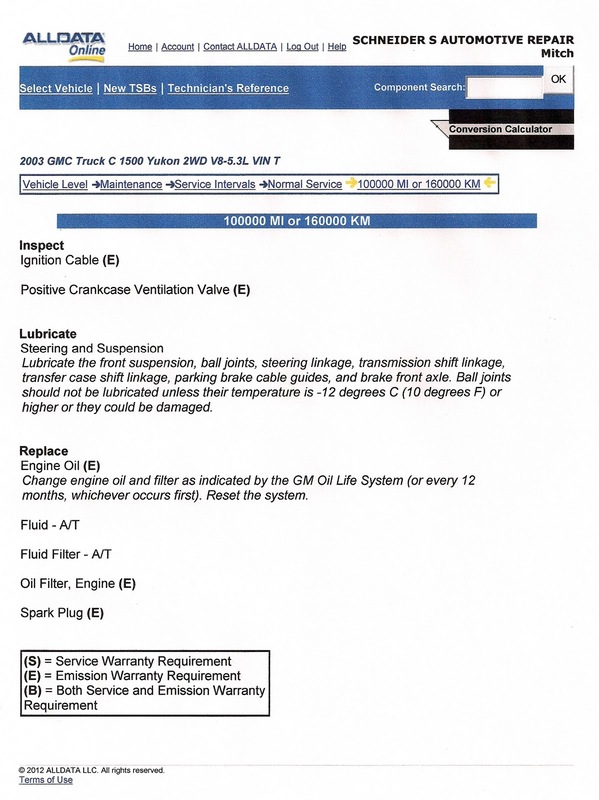 The vehicle manufacturer wants desperately for you to believe that the purchase and subsequent ownership of that vehicle was among the best and most intelligent decisions you’ve ever made because they desperately want you to buy another one when this one is ‘used up!’ They recognize that in order for that to happen you must feel that ownership is cost effective over the life of the vehicle. You can translate that into not spending a penny more than you have to in order to keep that vehicle on the road. Consequently, it is reasonable to assume there is no service called out in the manual – regardless of what that service may be – that is unnecessary or superfluous. In other words, if it’s in the book it’s there for a reason. Things aren’t quite so ‘Black & White’ when it comes to Suggested. These are services that do not appear in the Owner’s Manual, but are recommended by the dealership service department or responsible independent service professionals for a number of different reasons, not the least of which is personal experience. There are services that many of us have come to realize can and will both lower overall cost of ownership while extending the service life of the vehicle. As counter-intuitive as it may seem, there are times when spending more will actually cost you less in the long run! Until then, stay well and take care… And, remember, if there is something specific you’d like ask or a burning automotive service question you’d like answered, let me know. I promise to do my best to get you an answer that makes sense to you. Mitch, thanks for dealing with this poorly understood subject. The internet provides motorists with a steady stream of conflicting information about what vehicles need or don’t need and it leaves them unsure what to believe. I’ve noticed that even the most cynical of internet researchers are still just looking for a reliable voice at the front counter to explain why sometimes “more” is actually uh, “more”. I wish I had read this article a couple of weeks ago, what you said could of helped me better explain to my customer The difference Between Suggested & Required on a new serpentine belt.